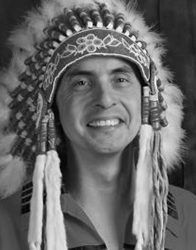 Chief Arlen Dumas was elected Grand Chief of the Assembly of Manitoba Chiefs in July 2017 in a historic first-ballot win. Prior to being elected, he served his own community of Mathias Colomb Cree Nation as Chief for over a decade. He was also the Vice Chief of Manitoba Keewatinowi Okimakanak and has held various positions on AMC Committees. Grand Chief Dumas, who grew up on the trapline in Pukatwagan, MB, is fluent in Cree and acts as a role model to young indigenous men and women looking to reconnect with their own traditions, languages and ceremonies. He was educated at the Mount Allison University in Sackville, N.B., where he studied political science and Canadian studies. He received an honourary doctorate of laws from the university in 2018. In his role as Grand Chief, he continues to be on the front lines of many grassroots movements and is an unwavering supporter of the families of Missing and Murdered Indigenous Women and Girls (MMIWG).